It’s not an exaggeration to say that sheep milk is close to our hearts at the High Weald Dairy. Mark and his parents started the business with a flock of 150 British Friesland sheep for milking, the first cheeses we made were sheep milk cheeses and now, seven of the 16 cheeses we make are crafted from sheep milk. Aside from all that, there are serious reasons for being fond of sheep milk: there are many health benefits of sheep milk and sheep milk cheese which you may not be aware of. Most people know that all milk and dairy products are great sources of protein and calcium and can help form part of a healthy diet – but did you know that sheep milk has a much higher calcium content than milk from a cow? Calcium is, of course, particularly useful for helping us develop healthy bones and teeth. What’s more, sheep milk is both higher in fat and protein than cow and goat milk which gives it a sweeter taste and higher nutritional content. You can see a table showing a typical nutritional analysis of sheep, goat and cow milk on the Nutritional Benefits page of our website. You may also notice that it has higher levels of zinc and B vitamins too. While a higher fat content may not be welcome news to all who are considering switching to sheep milk, it’s worth noting that 45% of the fatty acids in sheep milk are mono or polyunsaturated. Sheep milk contains lactose so may not be suitable for those with lactose intolerance but, according to the British Sheep Dairying Association, some people are able to tolerate it. Sheep milk has been shown to contain a higher proportion of medium and short-chain saturated fatty acids which lead to a higher lactose absorption making it easier to digest. Further to this, sheep milk products such as yoghurt and cheese can often be tolerated by people who have trouble digesting cow milk. This is because all the lactose has been converted to acid by lactic acid bacteria added by the cheese or yoghurt maker during the cheese-making process. Another of the benefits of sheep milk cheese is that it may help with the management of asthma and eczema. A switch to sheep milk is recommended by both the Asthma Research Council and the National Eczema Society. Among the alternatives to cow milk, such as almond milk, soy milk and oat milk (many of which are high in added sugar), sheep milk is a good natural alternative. British grassland is ideal for grazing sheep and they live outside for most of the year. We sell frozen bottled sheep milk from Top Paddock in nearby Horsham. The milk is very suitable for freezing and can be kept for up to four months. There is more information about the nutritional benefits of sheep milk cheese in an interesting article on their website. 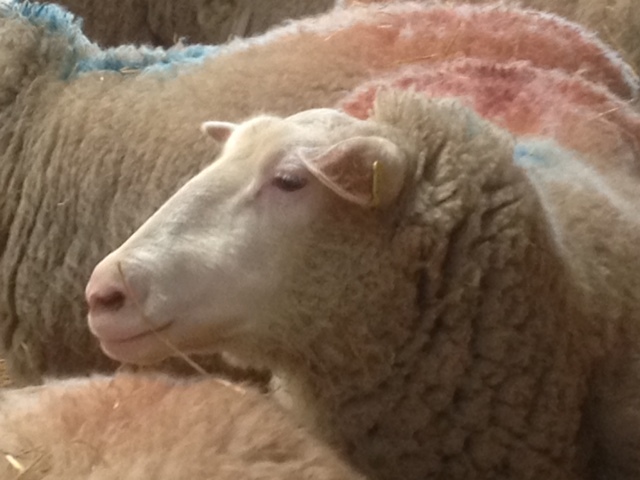 The benefits of sheep milk to a cheese maker, in addition to all this, is that it offers a good cheese yield. Due to the high quality of sheep milk, it takes about three-and-a-half litres to produce a soft sheep milk cheese like Sussex Slipcote, while an equivalent soft cow milk cheese would need around five litres of milk. Sheep milk also makes cheese that tastes good too. Here at the High Weald Dairy, we no longer keep our own flock of sheep but produce our range of seven sheep cheeses using organic milk from Orchid Meadow Sheep Dairy in Dorset: from fresh sheep cheeses like High Weald Dairy ricotta and Sussex Slipcote, through Mediterranean-style cheeses Halloumi and Medita (our name for Feta), to hard-cheddar style Duddleswell cheese. Take a look at our sheep milk cheese page for the full range. All High Weald Dairy cheeses are made with pasteurised milk which means they are safe for pregnant women to eat and are produced using a vegetarian rennet which makes them suitable for vegetarians too.